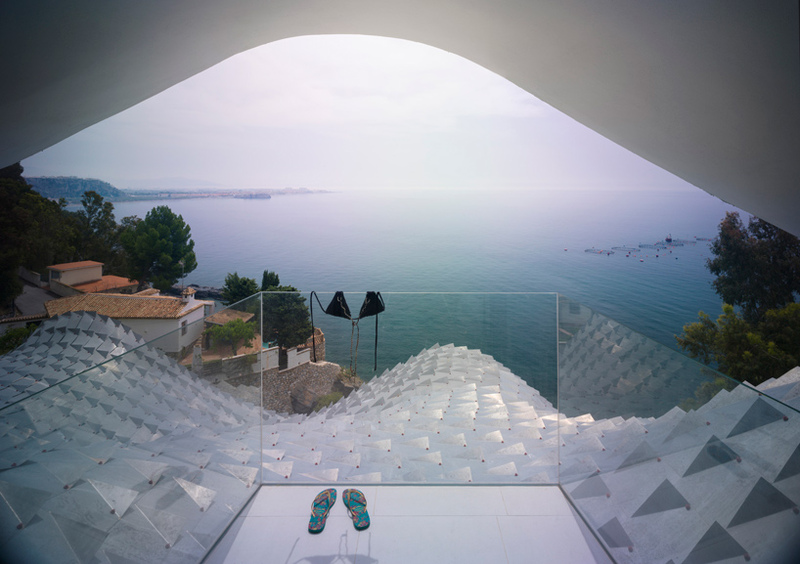 Taking inspiration from multiple eras of Spanish art and architectural traditions, this unusual home built into a cliff overlooking the Mediterranean Sea was conceived as a ‘contemporary cave,’ its undulating roof framing amorphous window openings on multiple levels. 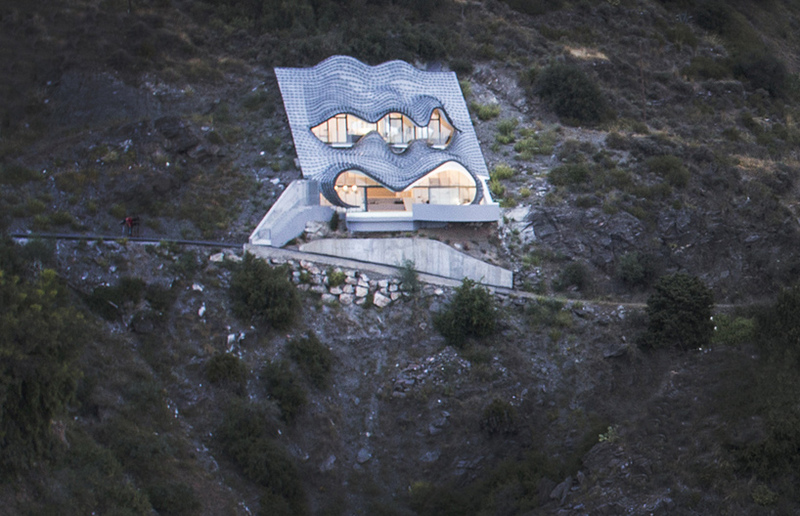 Between its metallic scales and its almost face-like appearance, the house almost seems like it could come alive, emerging from the hillside and revealing itself to be some sort of magical creature. 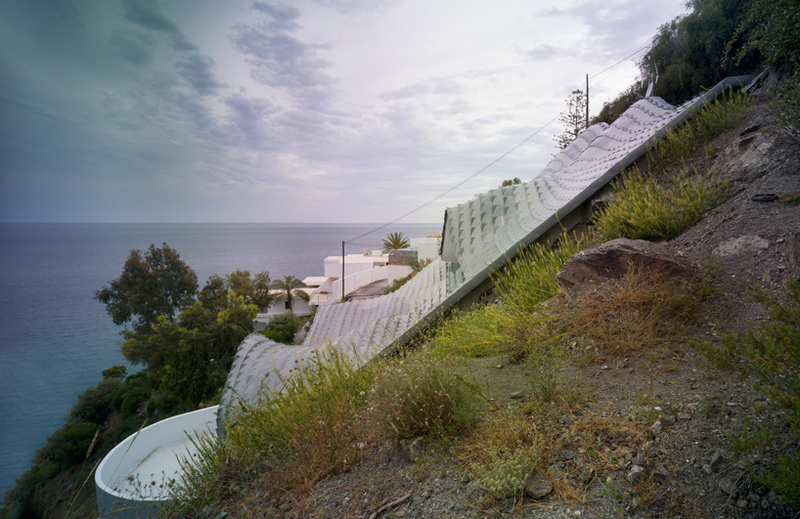 Spanish firm Gilbartolomé Architects took on the challenge of designing a modern residence for a difficult, rocky site in Granada. 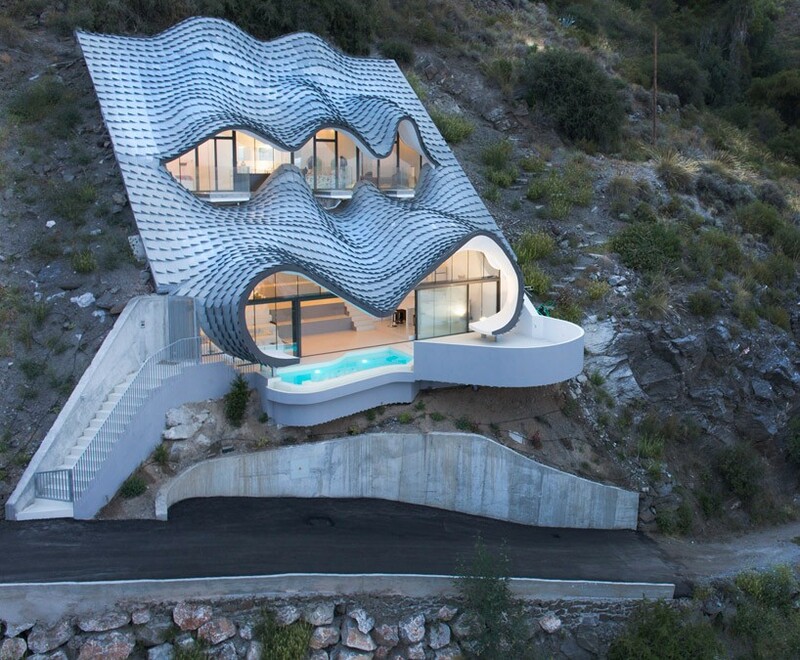 The form is reminiscent of the organic modernism of one of Spain’s most famous and distinctive architects, Antoni Gaudi, as well as the work of his fellow Catalan artist Salvador Dali. It’s almost as if someone crossed one of the former’s buildings with one of the latter’s drawings and simplified it for 21st century sensibilities. 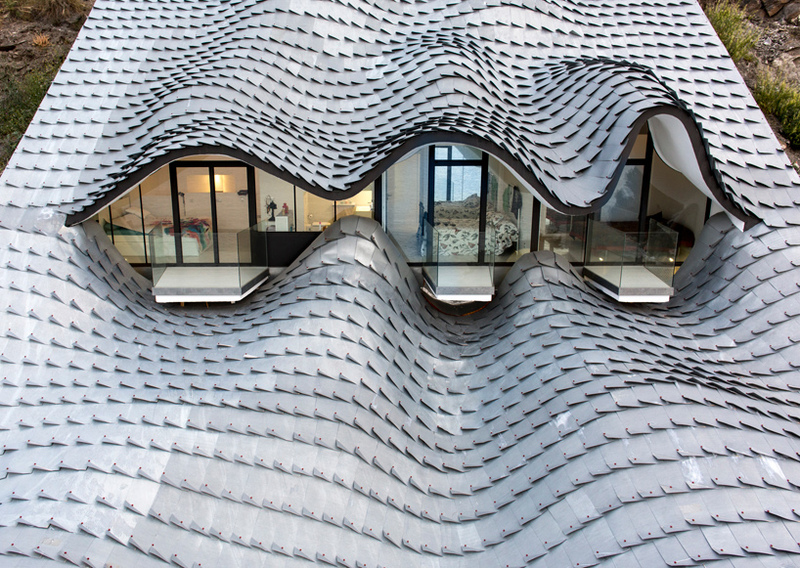 “The form of the house and the metallic roof produces a calculated aesthetic ambiguity between the natural and the artificial, between the skin of a dragon set in the ground, when seen from below, and the waves of the sea, when seen from above,” say the architects. 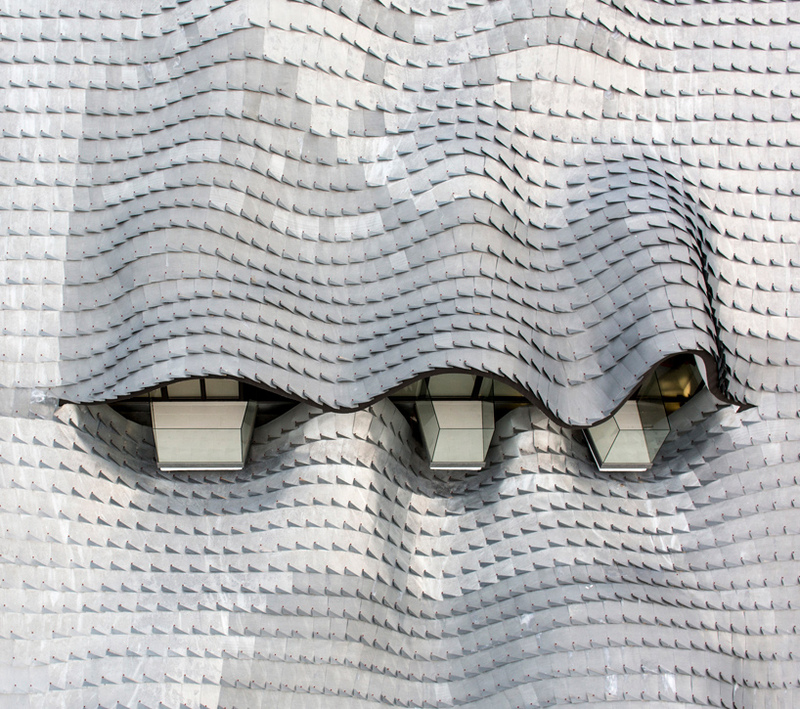 The roof is made of an efficient de-formable metal mesh of handmade zinc tiles applied to a hand-crafted framework system developed by a local engineer. Glass balconies jut out from the ‘eyes’ on the private second level, which contains all of the bedrooms, while the lower level extends out to a cantilevered terrace with a shimmering swimming pool. The glass walls of this level, which contains all of the home’s common areas, can be opened almost entirely to the terrace, bringing in fresh air and making it feel like you can walk right out into the sea. 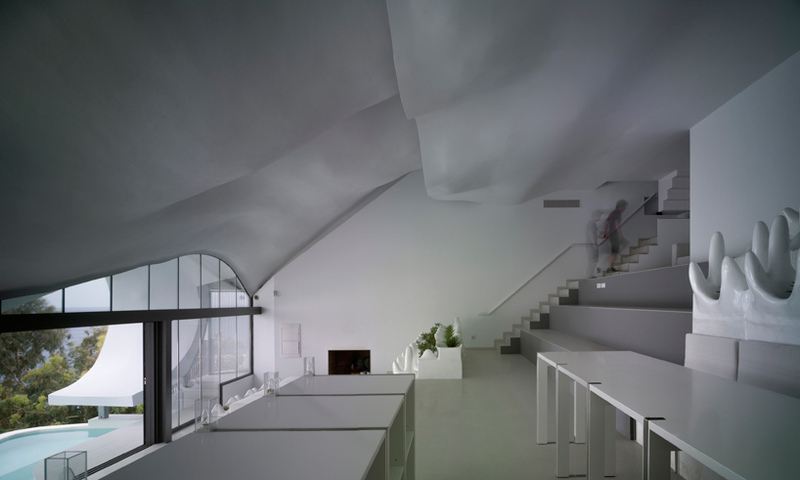 The interior is terraced as well, with large habitable steps leading up to the top floor. 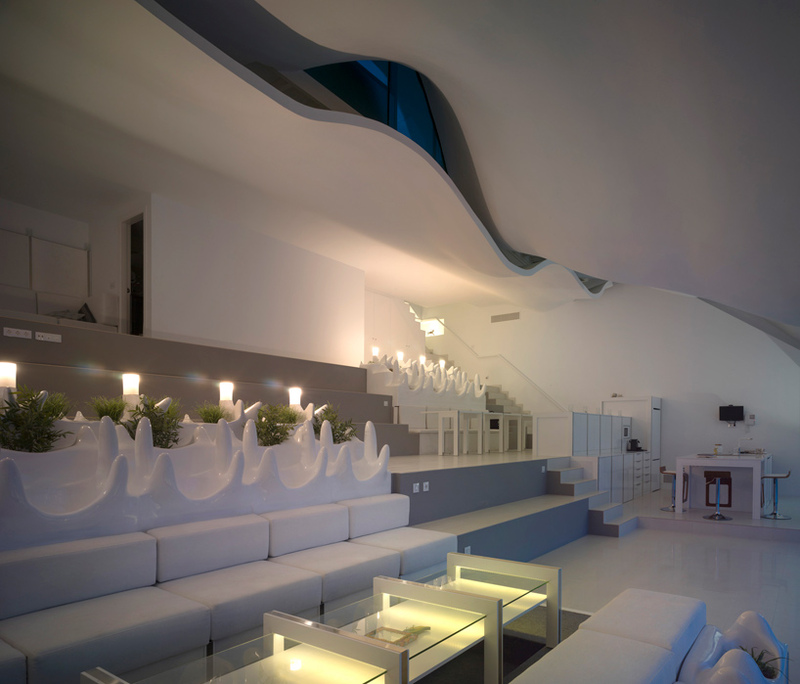 A double curved concrete shell forms the wave patterns on the ceiling. 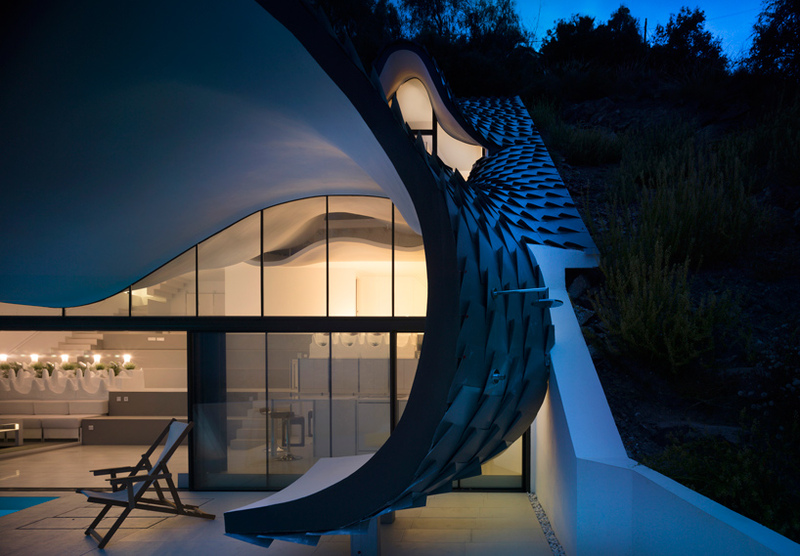 Building the home into the cliff not only stabilizes the interior temperature at 19.5 degrees celsius (67.1 F), it recalls millennia of Mediterranean cave dwellings. The result is quintessentially Spanish, but also avant-garde, a strange and somewhat jarring jewel studding the sandy landscape.